Britain's Ashley Theophane failed in his attempt to claim the WBA light-welterweight title after being stopped by Adrien Broner. The American four-division world champion failed to make the weight for Friday's WBA bout in Washington. The fight at the DC Armory still went ahead, but only Theophane, 35, was eligible to win the world title. However, referee Luis Pabon halted the contest in the ninth round, meaning the belt remains vacant. Theophane, who weighed on the 140-pound limit, was on the ropes in the second round and had a swollen eye by the fourth. The Briton recovered to land solid punches in the sixth, seventh and eighth rounds, but the bout was stopped in the ninth after Broner hit back with a body shot and a right hook. 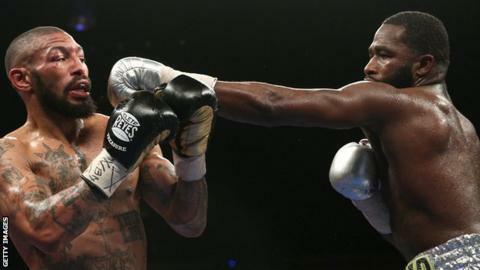 "I always could do better but I did what I had to do to get the victory," Broner, 26, said. "I've been going through a lot this week and to come in here and bottle everything up and stay focused and get it done, I want to give a pat on the back to myself."